Update for 2019: This is our 2nd Year for the Review of the Restore-A-Deck Semi-Transparent Wood Stain. This review will be updated through the years with new pictures as the stain ages. In 2018, our first full year if using the Restore A Deck stain, we had no issues with performance and saved a tremendous amount of time with the ability to prep and stain in the same day. We will continue to offer the Restore A Deck Semi-Transparent Wood Stain as one of our go-to decking stains for the 2019 restoration season. *We prefer the application to damp wood as it performs better and applies easier. Note: Restore-A-Deck Semi-Transparent Wood Stain can be applied to dry or damp wood. Applying to damp wood allows you the ability to prep and stain on the same day, saving you a tremendous amount of time. Summary: Restore-A-Deck Semi-Transparent Wood Stain is an advanced, water-based, semi-transparent stain formulation designed to penetrate deep into wood pores for maximum protection and longevity. Restore-A-Deck Wood Stain protects wood from harmful UV rays and damage caused by water penetration. 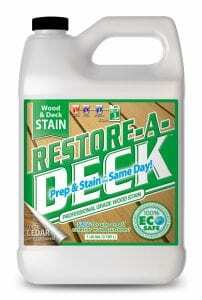 Restore-A-Deck Semi-Transparent Wood Stain is safe to use, has a low odor, and is easy to clean up with soap and water. It is ideal for all wood types including pressure treated pine, cedar, fir, or redwood. Recent advancements in water-based wood stain technology have allowed the active ingredients in the Restore-A-Deck Stain to offer better UV protection, excellent penetration into the wood grain, the ability to apply to damp wood, all in 4 beautiful semi-transparent colors that highlight the natural wood grain. RAD Wood and Deck Stain will increase the life, appearance, and durability of all exterior wood surfaces. With the easy to apply and maintain Eco-Safe formula, you’ll be able to finish faster and enjoy your exterior wood or deck for years. – The Restore-A-Deck wood stain color we used was the Semi-Transparent Light Walnut. The initial appearance was a rich brown with a hint of red (see pictures below) after drying. The Restore-A-Deck Stain penetrated extremely well into the wood grain on our test deck. No surface film on top of the wood.